El Principe Valente is the Portugese name for our hero. In 1972, the Publisher EDITORA PALADINO (sometimes also mentioned "Saber"), from São Paulo, published 17 issues in the format 13x19cm, 100 pages each. Those books are poor as a document, because the quality is bad. 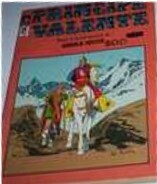 To reformat the pages in the mentioned size grossly disfigured Hal Foster's work. There was also at least one Extra edition book. This book is numbered "2" and include also BRICK BRADFORD and ERIK, O VIKING. It has 288 pages in the same small format. Value is around 3 USD.